In the 1920s, the sales managers at Fulda Reifen, known at that time as Gummiwerke Fulda, were quite sure that the brand’s image should not be communicated in isolation from the end-product that stands on four tires. Consequently, they bought a bus, had it converted into a luxury coach and as of 1925, presented Fulda’s new patented Parabel tire all over Germany and the neighboring countries. The first of a long series of special models was born. Whether advertising vehicles equipped with record players and loudspeakers, the tail section shaped like huge tires, standing in front of the Reichstag in Berlin (1931), whether as a tire test streamlined bus with special license for speeds over 140 km/h (1961), or as a show truck series (from 1985) to demonstrate the respective latest high-tech truck tire generation – in all chapters of the Fulda company history there have been Fulda special vehicles. The most challenging technical commission to produce a special model in the first half of the company’s history with the simultaneous mysterious conclusion was awarded by Fulda in 1938. The starting point was the rapid development in automotive design in the 1930s which, due to the increasingly refined aerodynamic automobiles, permitted higher and higher speeds. In addition, the construction of the “Autobahn” provided motorists with the opportunity to travel further at higher speeds. Dörr & Schreck accepted the order and looked for the absolute leading cooperation partner in automobile manufacturing at that time: Maybach Motorenbau. Together and with the help of the well-known aerodynamic specialist, Freiherr Reinhard Koenig Fachsenfeld, they designed a three-seater streamlined car on the basis of a Maybach SW 38 chassis. The Fulda coupé with its two-color paint job and pontoon form had a long extended tail section sloping to the rear. From a bird’s eye-view the overall line looked like a rectangle with rounded edges. The rear wheel arches were completely panelled, as was the underbody, even the door handles were partly recessed. To reach the speed of over 200 km/h demanded by Fulda, the technicians installed a 6-cylinder engine with 140 hp. The exceptionally low air resistance coefficient of 0.25 (a figure of 0.6 was usual at that time for series-produced vehicles), also helped guarantee this speed. The precondition was, however, that the chassis did not exceed a weight of 1,600 kg. On 27 July 1939, Dörr & Schreck finally announced the completion of the SW 38: “The car is extremely interesting and beautiful. It lies well on the road and the streamlined shape already makes itself felt at 60 km/h. Soon afterwards the car was delivered, but as a result of the outbreak of war its use was soon to be very limited. During the chaos of war the test vehicle disappeared and was never found again – its whereabouts remain a mystery to this day. the emotional avalanche that the streamlined car triggered off several management generations later at Fulda Reifen. their optimal performance profile in the critical eyes of the tire specialists. In 2005, the successor to the long successful and tried and tested Carat Extremo will be introduced to the specialist trade. A summer wide tire of an extra class – the Fulda Carat Exelero. High performance – sporty, dynamic and and comfortable. How and in what setting such a high-end product should be presented? In 1996, the manufacturer from Fulda already faced the same problem with the Exelero predecessor and that was solved with brute force. The noble design workshop Gemballa created a show vehicle based on the Porsche 911 convertible with a 3.8-liter Biturbo engine, 600 hp and all-wheel drive which catapulted the racing vehicle standing on its 18-ich rims and Extremo tires to a maximum speed of 350 km/h. Why not once again design such an automobile built around a top Fulda product? The previous concept was successful. This time the problem was different. The Exelero tire line, for the first time tested in advance by the TÜV (Technical Control Board), is not comparable with the predecessor generation. This applies to the design and the extended extreme sizes up to 315/25 ZR 23 version! A complete wheel in this still weighs around 46 kilograms. How can the claim of this tire technology be interpreted in automotive form? During the team meetings the image of the Fulda streamlined vehicle of 1938 repeatedly went through the minds of the decision-makers. Then it became clear: the successful comeback only a couple of years ago of Germany’s most exclusive automobile make tipped the balance – it had to be Maybach. A go-between was quickly found. René Staud, top photographer for automobiles, a man with 31 years of work for DaimlerChrysler and 20 years for Fulda Reifen behind him. Leon Hustinx, Maybach, meets Bernd Joachim Hoffmann, Fulda. A cooperation is agreed on. Then everything moves very quickly. Maybach agrees to make a platform available on the 57 basis. The initial ideas revolve around the basic idea of the SW 38 streamlined car, they are rejected. This vehicle will stand on the best tires that Fulda has to offer. For the Fulda project team under the direction of Bernd J. Hoffmann, Managing Director, Helge Jost, Marketing Manager and responsible for the communicative project interface, and Rolf-Dieter Stohrer, Senior Manager Car Tires, responsible for wheel and tire technology, it is therefore quite clear: the vehicle should be more than just a reproduction. To quote Oscar Wilde they want only the best of everything. What ever happens no retro design! Why not revive a good und effective cooperation once again? In the middle of the 1990s, Fulda Reifen had already had a show truck designed by the students of Pforzheim Polytechnic’s Department of Transport Design under the direction of Professor James Kelly. Since the year 2000, to mark the 100th anniversary of Fulda, this uniue vehicle with its futuristic aura, the trailer of which can be divided lengthwise in the middle and extended, has been on the road for use at many events. Not only Fulda, also its cooperation partners Maybach and the design department of DaimlerChrysler have had very good experience with Pforzheim Polytechnic and were happy to agree. On the part of the Polytechnic, Professor Kelly and Professor Lutz Fügener assumed responsibility for the project and selected four students from the 6th semester who should produce designs under identical conditions. On behalf of DaimlerChrysler, Professor Harald Leschke who manages the Group’s future projects, assumed responsibility for the project and the links with the students to the company’s design department. Because the students not only worked on the design in the college. They were also given the unique opportunity during a practical semester to work directly in DaimlerChrysler’s design center in Sindelfingen, under the wings of the design professionals. Included was the use of the latest technological facilities right up to 3-D animation. The implementation of the creative ideas was handled quickly and very professionally. From the initial briefing at the Polytechnic (only formal specification from Fulda: Whatever happens no retro design!) through to the selection of the final design which should be realized, just less than eight months passed by. In the end, Fredrik Burchhardt 24, from Bowenden, emerged as the winner. His design was the most appropriate in terms of the transformation of the design from the study into reality. Also the relation of the design between the two vehicle generations was most striking in Burchhardt’s design. However, Professor Leschke lavished his praise on all the students involved: “Even though Fredrik Burchhardt’s design won in the end, the ideas of the three other students should also be integrated. The project will remain a joint effort. Every single one of them displayed so much imagination, each of the designs could have been realized.” In appreciation of these good performances, all four designs were milled as 1:4 scale models. Ultimately, the design results can be described as a complete success. The Fulda/Maybach project car was created in a unique interplay between design students, their professors, the specialists from DaimlerChrysler and the Fulda team. The result: a new vehicle dimension. The designers brings together the best of two vehicle genres – the grandeur of a limousine and the fascination of a coupé. As a result, the Fulda/Maybach project car combines muscular strength and apparently infinite elegance. The designer mission was accomplished: The Exelero project is the ambassador of a new tire generation, the Fulda Carat Exelero in sizes up to 23 inches. An idea on the move. Following the many model phases, whether it be the 1:1 study, the exterior design model as a reference for the form release, the interior reference model, the innumerable wind tunnel tests, the bodywork for the chassis in working order with subframe – eventually these phases of searching and coordination are concluded. Now it is time for the technicians and engineers. the reference vehicle for the new broad tire generation Exelero must withstand a constant load in use on the road, on the freeway, at trade shows, exhibitions and other events. The technically impressive values of the Fulda Gemballa show vehicle should serve as a guideline for the Exelero sports coupé. The standard type 12 Maybach engine with Biturbo turbocharger produces 550 hp. Even this imposing engine cannot accelerate a vehicle weighing around 2.6 tons to a speed of around 350 km/h. A matter of honor for DaimlerChrysler’s engine specialists in Untertürkheim. The designers dipped into their technical box of tricks and increased the cubic capacity from 5.6 to 5.9 liters. They further optimized the turbocharger and, lo and behold, the 700 hp and torque of at least 1,000 newton meters calculated for the desired speed was achieved. After around 100 hours of non-stop testing on the engine test bed, corresponding to a road test of about 15,000 kilometers, the unit was ready for use. Leon Hustinx, the Director of Sales and Marketing at Maybach, was so impressed by the Exelero project that he quickly and unbureaucratically provided Fulda with the platform of a Maybach 57 limousine. How to conjuring up a sports coupé from it? For Jürgen Weissinger, head of development at Maybach, this was not the first tricky question. He is more familiar with the engineering of the Maybach than anyone else and, as project manager in pre-development, he has produced numerous feasibility studies for the make. When comparing the dimension concepts of the Fulda streamlined car of 1938 with the 57 platform, an astonishing correlation of measurements already emerged. Although today’s Maybach is about 290 mm longer, e.g. in the wheelbase, the breadth and height of the veteran car strongly resembled the 57’s dimensions. the position of the tank remained unchanged, the refuelling nozzle had to be shifted etc..
All in all, however, the necessary changes were made in the short time available. The development work connected with the rim and the wheel proved equally tricky. Rolf Dieter Stohrer, Senior Manager Car Tires and responsible for wheel and tire technology in the Fulda project team contacted several rim manufacturers and realized the rim called for in the design with Ronal. The corresponding design was milled by Ronal from a complete piece of metal, i.e. from a solid block weighing 257 kilograms a rim measuring 11.0 x 23 inches was produced with a weight of just 23 kg. All four rims were individually produced and because they are turbine wheels, the direction of movement had to be taken into account. Thus, two were produced for the left side and two for the right. However, these Ronal rims are only needed for the “See true” vehicle model. This is the exact copy of the Exelero sports coupé which, however, is not used in the road but merely at show events. The real rims for the high speed tests come from ATP-Excentric in Bremen. The reason: the ATP rims have a cross spoke design which can be simply fully-panelled for the speed tests. This procedure means an additional 3-4 km/h for such gigantic 23-inch wheels. The air pressure of the tires will amount to 3.6 bar for the high speed tests. As a rim can bear a load of 1,050 kilograms, for example, the load on the rear axle of 1,400 kilograms is no problem, i.e. there is a sufficient reserve. After all technical requirements included in the engineers’ specifications had been checked, the tests began. An idea conquers the road. 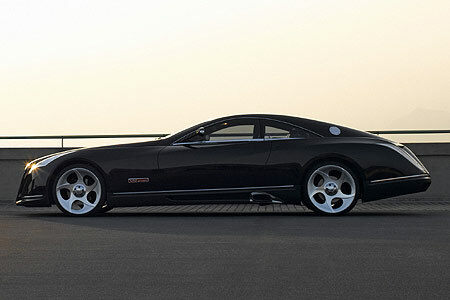 Maybach Exelero and waits for the signal to start in his attempt on the record. This highlight of the project had been preceded by a number of intensive tests, starting with the various wind tunnel phases. In accordance with the results, the Exelero was optimized correspondingly. 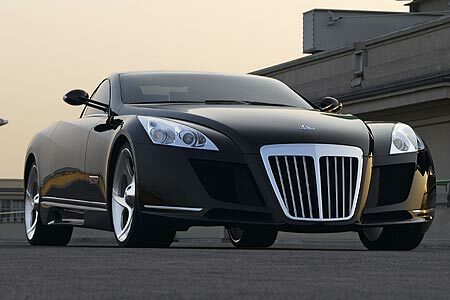 Then in March came the roll-out in Turin where the Maybach Exelero was officially handed over to the client, Fulda Reifen. In mid-April, it then went to the so-called “running-in track” at the Sindelfingen plant. Here, the vehicle was subjected to intensive checks of its engine functions, brakes, chassis and handling etc., already at speeds of around 200 km/h. Finally, at the end of April, the technical inspection of the Exelero was carried out on the DaimlerChrysler test track in Papenburg, i.e. the test measurements conducted provided the basis for preparations for the attempt at the high speed record in Nardo. For example, Spoilers were tried out in various positions and further adjustments made to optimize the speed and stability. Since the Exelero vehicle is intended to prove itself in the long run in practical use, it was appropriately designed as a road machine and needed a license. That meant that the TÜV (Technical Control Board) had to give its technical blessing to the Exelero. Peter Kühlwein, one of the most experienced experts of TÜV Automotive GmbH, Gruppe Süd, tested and evaluated the safety-relevant vehicle components like the seats with the safety belts and the weight distribution within the car. All points were checked off to the satisfaction of the TÜV engineer or otherwise reconfigured. When all the reservations from the side of the DaimlerChrysler specialists, the tire engineers and the TÜV experts, had been satisfied, nothing stood in the way of the final mission in Southern Italy. The entire team already arrived on Thursday. On this day and the next, the Exelero was completely checked yet again. On Saturday the team checked all the measuring facilities and conducted trial measurements as well as several test laps with technical project manager Jürgen Weissinger at the wheel. Early on Sunday morning then everything was ready: The final test could begin. At 7.09 hrs., Klaus Ludwig already completed his first lap at a speed of 346 km/h . Just one lap later the targeted record of 350 was broken. The FIA standardized measuring unit registered a world record top speed of 351.45 km/h!